Transformations of Work gives a comprehensive analysis of the development and current challenges of national systems of labour law and social security. Market volatility and uncertainty have put welfare and social security policies back on the centre stage and point to the need for closer links with employment policy. The inability of existing income support systems to respond to the increasing fragmentation of people’s working careers, the needs of people in difficulty, and the spread of various forms of poverty calls for well-coordinated and efficient responses. This volume highlights the best practices in the various regions of the world in the contexts of international and EU labour law, industrial relations, and social security. It is a source of inspiration for all those who strive to ensure that everyone benefits from the opportunities that will be created in the coming future. It also recognizes the critical role that social protection plays in achieving this and highlights the need to put people and work at the centre of national strategies for sustainable development. the role of the State and industrial relations. 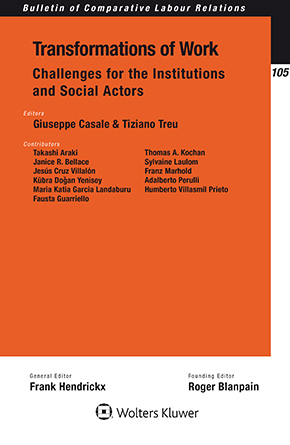 In its insistence that, despite the radical changes in the world of work and business brought about by globalization and digital technologies, the decisions of institutions and public and private actors can lead to a more coherent system of international economic and social governance, this timely volume shows the way forward. Practitioners and scholars in the areas of labour law, industrial relations, and social security will benefit immeasurably from its expert analyses and exhaustive and detailed recommendations, and they will find this book an easy reference work. Learning from Our Past: What Would Our Most Respected Forefathers and Mothers Want Us to Do in Our Time of Crisis? New Forms of Labour: New Solidarities? Safeguarding the Rights of Migrant Workers: Another Challenge for Labour Law?